We begin this story in the middle. Six of us have just clambered over last rocks onto the crater rim of the planet's highest free standing mountain. We felt like we were on top of the world, standing there with a cup of tea, with the sun rising behind us with Mawenze in sillhouette, a full moon on the western horizon and a cutting wind blowing from glaciers the next generation might not get to see. And for me & Kavi it was one hell of an anniversary! The night seemed like a distant dream, from where we were. We'd started walking sometime before midnight, from School hut down in the east of the mountain. At first progress was slow and measured, legs freezing up as we took stops. Over the night we had left Navdha behind at Hans Meyer cave because she couldn't keep pace with the rest of us. She was going to make it too, but that was no place for waiting. We had to push on towards the peak on the west. At Stella Point, we dropped off all our backpacks and headed up. 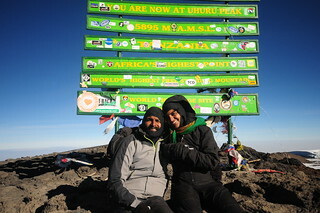 Sleep deprivation was competing with the oxygen withdrawal at this point and with unsteady legs we got to the very top. Not that there's anything to see there, just a board and tickmark on your list. But it did mark a very important point in the whole trip. From this moment now, everything would be downhill. As much as I could feel proud about that moment, we were there thanks to the efforts of 32 people who were behind us and often ahead of us to set up camp & welcome us with hot food in every camp. To them, I'd like to say Ahsante Sana! Look back six nights back and you'd find a different sentiment among as we settled down in our first night at the Big Tree camp. The comforts of the city was still fresh on our minds, everything seemed uphill. Sure, we were full of popcorn, warm chai and not too worse for wear. But in a crowded campsite, we had trouble sleeping and the Diamox ensured I was waking up every two hours to pee. And in the near zero temperatures, we were thankful for the zippered toilet tents. The second day was a jaunt through the rainforest too. But this time the mountain decided to rain on our parade. Never before have I regretted not carrying a poncho so much. After moving my camera under Partha's poncho, I decided to ignore the damp pants and walk it off. 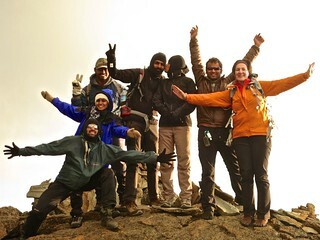 By the time we reached our camp, the Sun had come out of the clouds, but the rain had dampened more than our spirits. Our sleeping bag liners were wet, as were my waterproof pants in my bag. After drying some of that in the cooks' tent, we settled in for what turned out to be a really cold night. 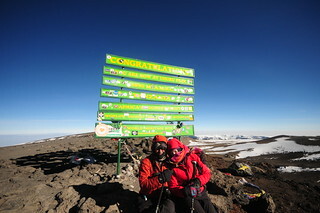 We were already on the smallest mountain of the trio that makes up Kilimanjaro - Shira. And for the very first time, we could see the giant we were out to climb - Kibo. 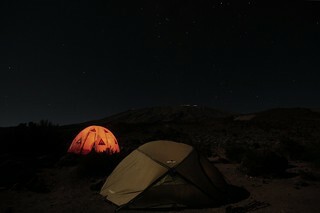 The night at Shira 1 camp, the temperatures dropped below freezing. I knew this because my stomach decided to void itself at 2 AM, leaving little choice but to follow the call of nature. 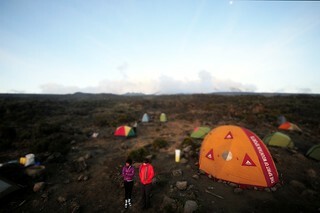 By early morning, the tents had started to sweat on the inside from the moisture in our breath. A thin sheet of ice had started to form on the roof, which would melt once the Sun came out and drip back onto our faces as we got dressed up. The walk to Shira 2 camp across the plateau was rather uneventful. We split up into groups, with Partha (the fittest among us, also the oldest) leading in, with Navdha in the rear and the rest of us distributed in the middle. 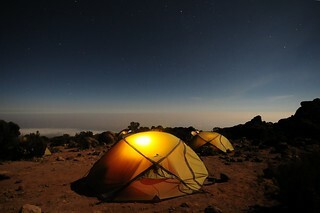 This was a rest day of sorts, so we landed up at the camp around lunch time and settled in for a nap. We were out of the clouds and we had entered the heather. The walk from Shira 2 to Moir hut was perhaps the easiest of the trip. We had all acclimatized well. Given a flat approach to the next camp, I took off and tried to catch up with Partha who had moved ahead. But Kavi was having trouble and had to grab her inhaler. The rest of the section was covered comfortably, but in rather good time. 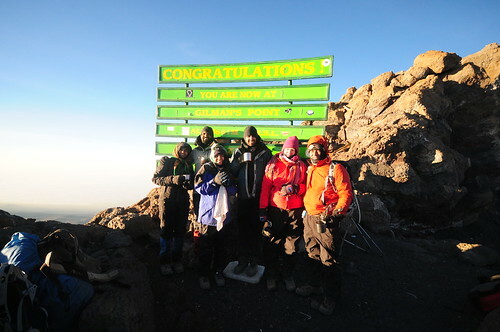 This was the last part we had in common with the Lemosho route, so we we took the evening to do some more climbing to try and breathe some air at 4000 metres. Navdha had trouble climbing, so we sent her back and headed up the rock to watch a brilliant sunset. 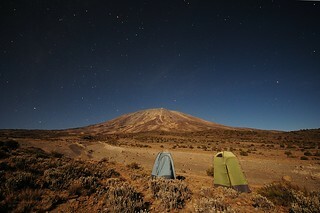 Unfortunately, that meant that we had to do our climb down using headlamps - but we were in a good mood all of us. The switch over from Moir hut to the Northern Circuit was what followed the next day. A bright sunny day for walking, but the guides had convinced us that it was shorter than it was. After a number of "camp is beyond that ridge", we finally got to the Pofu camp. I think we lost trust in guides a bit that day. Eventually even after we saw the cample, the walk took us an hour to finish even after because of the ridges and switchbacks slowing us down a bit. This seemed like a temporary campsite, because we were the only ones there. And being out of the wind, I took this opportunity to actually use my camera in the night. And the D300 doesn't feel like it was meant to be used with gloves on - I had to leave my gloves off to twist the aperture dials. But the small amount of skin off my fingers was a price worth paying for those pictures. By now we had settled into a nice rhythm & perhaps had forgotten how the world down below the clouds were. 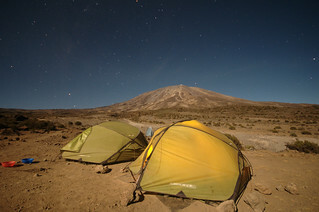 The air had dried up a lot, but the sparks that flew when we used our silk sheets inside the sleeping bag was just something normal that we had come to expect. 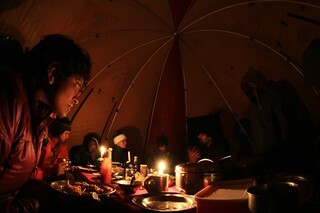 The tent had become our home, the morning wake up routine had kicked in, energy bars and quick snacks were the norm, headlamps were enough light to live with and we were all comfortable to some extent. To reach camp every evening was coming home. We stopped over at the Third Cave campsite next. The camp was near a dry riverbed (or flood path). The night was brilliant and full of moon light. Most of my long exposures ended up looking as if they were shot in daylight. 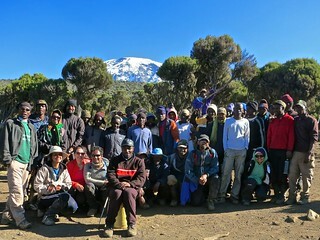 By now Kilimanjaro was looking like a small hill to our right. If not for the altitude, we felt like we could just run up the mountain in half a day. But without anything to provide scale, the distances were not apparent and we had more than a vertical km left to go up before we got up there. School hut was the last camp we were in. By now we could really taste the victory. The mountain was right there - but the cold was starting to really get to me. The final ascent was to be done in the darkness of night. The gloves weren't helping and neither did the lack of sleep. We headed out with Navdha leading in front and setting the pace. The boys stuck to the back of the group. We had wrapped all our water bottles in socks, but I had an excessively gatoraded pouch of water hidden under my jackets. The water in the bottles froze up pretty quickly - the sipper was kept free of ice by blowing air back into the tube to push the water away from the valve. But the cold wind was hard to bear as the windchill dropped below -20. We walked single file up the hill, but too slowly for us to actually get warmed up. Frequent stops didn't help that either - I kept running into the backpacks in front. The guides picked up the girls' backpacks pretty soon. The moon was high in the sky as we slowly started to turn off our headlamps. We started to really sleepwalk uphill in some pretty steep trails leading up to the Hans Meyer cave. There we stopped for a short break out of the wind, when the decision was made by Jimmy, our lead guide, to split the group up into six and two. So the six of us trudged on, picking up a fair amount of speed and a couple of hour's lead on the stragglers. 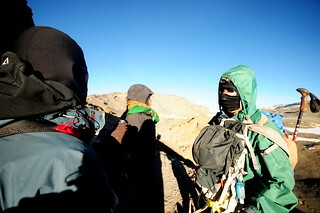 And then the sun rose behind us as we made a final push to reach the lip of the crater. Downhill was hard challenge for my knees. The lack of water was turning into a big problem, the heat was picking up in the morning, but the ice in our bottles remained frozen. We pretty much slid down entire hillsides full of scree to the bottom. In the middle, we ducked into a cave, got a few minutes of sleep. Even though we could see the Barafu camp at 8 AM, it took us till 1 PM to actually get to the spot. Dehydration, lack of sleep and the effort of the previous night was starting to catch up to me - my camera was cutting into my shoulder muscles which were starting to seize up and turned into a glowing ball of pain. I had to get one of the guides to carry it downhill. Barafu wasn't our final destination still. We had just bivouacked at the camp, waiting for the other two. Lunch was being prepared and the tents were up so that we could get an hour's worth of sleep. We heard over the radio that Navdha is coming down the rescue path instead of the regular trail, with two porters who will carry her if she can't walk. Finally they caught up with us and joined us for lunch. Somewhere around 4 PM, we headed down towards the Millenium camp which was our resting place for the night. By now Navdha had completely lost the ability and the will to walk. 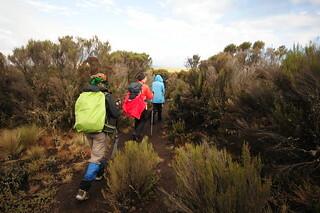 She had to be carried downhill on a stretcher from Barafu to the final campsite at Millenium camp. The walk was pleasant beyond belief, the lower altitudes were filling our lungs with oxygen and the brain was on a pleasure trip after days of being oxygen starved. It was unbelievable to see the mountain above the clouds that day and realize that a few hours ago we were on top of that. We had walked for about 16 hours out of the last 24 and 20+ out of the last 48. The rest of the journey was made in some pain by me. My knees were gone, the downhill steps were hurting every bit of the way and unlike uphill there was no reward at the end of this trail. Sullenly, I somehow got to the bottom to find folks selling coca cola for all those who associated it with their normal life. For Navdha, they had arranged an ambulance pickup from somewhere up on a 4x4 trail, so we headed for the lodge as soon as she got dropped off. The moment we got back to the lodge, I took a hot & unnecessarily long shower and slept off. The crazy people I travel with ended up going to Moshi town to shop instead, with their sunburns covering their noses glowing pink. It has been an incredible experience to leave civilization behind, leave all the comforts behind in the quest of this one singular goal. Somehwere in the back of my mind, I want to go back and do it all over again. 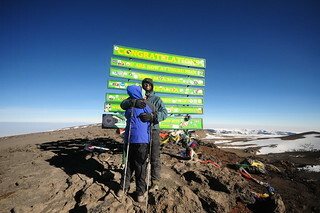 Perhaps in 20 years, after Kilimanjaro erupts again.